ITV saddles up with Carm Productions on first ever "Virtual Grand National"
ITV Sport will use the latest CGI technology to screen a virtual running of the Grand National, a day before the world's greatest steeplechase comes to Aintree. The Virtual Grand National 2017, which will air on ITV4 at 8pm on Friday, will see 40 runners and riders from this year's field race each other over the likes of Becher's Brook and The Canal Turn in what is a TV first. 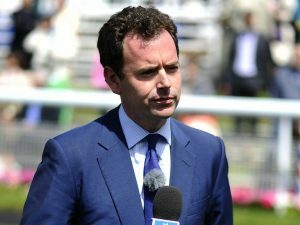 Independently produced by Manchester-based Carm Productions, the programme will be hosted by former Channel 4 anchor Nick Luck, who will be making his ITV presenting debut as the broadcaster gears up to screen its first ever Grand National. Experts including Bob Champion - who rode Aldaniti to glory in the 1981 race - and Richard Pitman will try to outwit the technology, which will attempt to predict what will happen in Saturday's showpiece event. Luck said: "This is a fantastic innovation. It will be enormous fun to see if the specially developed software can really be more accurate than the experts, and whether it can weigh up all the factors such as the going, weather and power of the horses to not only produce a brilliant race but also get close to forecasting the real outcome." The idea has been developed with virtual sports company Inspired Entertainment. "It was an irresistible idea," said Carm's executive producer, Rob McLoughlin. "ITV wanted a curtain raiser to its first coverage of this enormously important race which would be different and distinctive. "It is innovative and fun and the animators have been working around the clock for 12 months to produce something truly remarkable and they have been aided by champions such as AP McCoy, Richard Pitman and others. It will be fascinating to see the outcome."